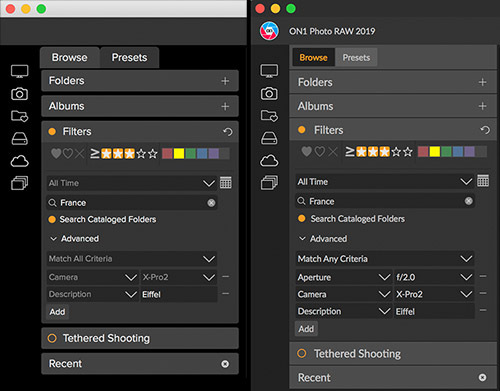 ON1 Photo Raw 2019 is a major update to the previous version and a welcome one for me. I feel like this product has really matured and offers a great all-in-one solution to image editing and management. I’ve been using Photo Raw since it was first released and the ON1 suite of plug-ins before that. I think they’ve finally incorporated all the best parts of the plug-ins and come up with a unified and intuitive workflow. My video above highlights what I think are the best and most useful features. With 2019 I’ve found a huge speed increase from my latest 2018 version. That, coupled with a redesigned and simplified workflow make for a refined all-in-one solution that’s really enjoyable to use. The previously separate modules are all in one place now with non-destructive edits. This makes a HUGE difference for an efficient workflow. Develop, Effects, Portrait, and Local are all in tabs with image layers just above them. Previously Photo Raw had 4 standard modules: Browse, Develop, and Effects modules that worked in Raw with NDE (Non Destructive editing) and Layers as a separate module that ultimately meant converting your raw file and losing the ability to do non-destructive edits. Not to mention the old Layers module was a bit confusing. In this new version, it’s just Browse and Edit for everyday tasks. Edit now has tabs for easy switching among Develop, Effects, Portrait, and Local adjustments and all edits are non-destructive. All except the raw Develop panels become layers with their own opacity sliders, blending options and comprehensive masking tools. It’s a much more efficient workflow due to this redesigned interface. The filter selection dialog is greatly improved and they now have fully implemented renaming of layers, both filter and image types. As seen in the screen shot above, one can now add image layers without losing non-destructive editing and without having to go to a separate layers module that befuddled many users in the old version. The new integrated image layers are much simpler to use. You can add multiple image layers either as a new image layer or duplicate an existing one. ON1 has finally integrated all the wonderful capabilities of their legacy portrait plug-in. Those of us that used this in the past have been wanting it to be fully integrated into Photo Raw. Now it is! In 2018 they had skin retouching but they’ve added the eyes and mouth controls. It has the automatic face finder where it creates a mask and adjustment pane for each face. All this makes it very fast and easy to whiten eyes and teeth, accentuate lips, add detail to eyes and improve skin. There are 9 controls for theses plus the usual masking, blending options, and opacity. A useful keyword list has been added. You can either scroll, which isn’t too practical when you have a lot of keywords or you can type in a search and make use of several options when you right/option click on a keyword. 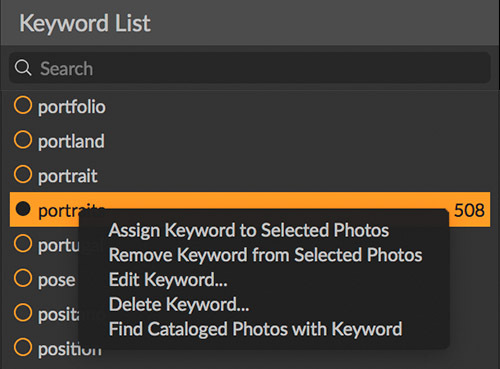 Of course you can accomplish some of these tasks using the Filters search and keyword entry box but it’s always nice to have more options and I like that it gives you the number of photos for a particular keyword. In addition to Photo Raw 2019 handling everyday image management and processing tasks it has a few specialized capabilities. New with this release is focus stacking. When invoking it, you get a dialog that pops up essentially saying “more to come” with the next (free) update though it is operational right now. ON1 also includes HDR and Panoramas from the previous version. These are all separated from the Edit menu which makes perfect sense as these aren’t really everyday tasks for most users and it would have cluttered the new interface. ON1 does claim non-destructive editing for HDR. 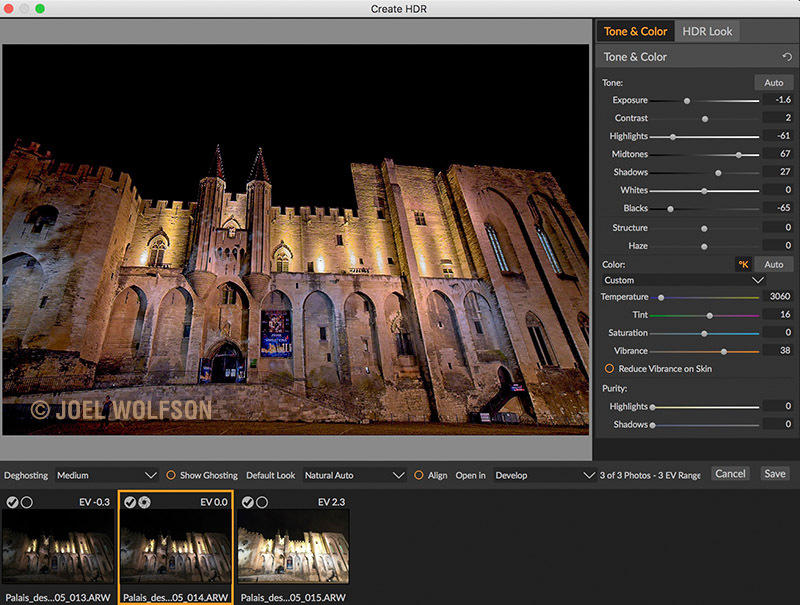 The ability to create HDR (High Dynamic Range) photos is one of the specialized tools available in Photo Raw 2019 along with focus stacking and panoramas. Thankfully, most of my would-be complaints are pretty minor at this point in the product cycle. My biggest one is with import dialog. If you want to import directly from your memory card you can’t group the raw+jpeg into single files for naming like you can in Lightroom. Consequently if you implement good organizational practices and rename with sequence numbers on the import, your raw and jpeg now have different identifiers and you can’t group them even with the Group Raw Plus JPG option in the File menu. I have a pretty good workaround for this and it’s no deal breaker but I don’t see the point of importing with the import dialog without this ability. This release may be the one that allows you to finally let go of Lightroom. Their updated migration tool should prove to be much better than the previous one. 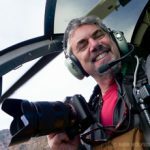 The 2019 version will allow you to transfer all your non-destructive raw edits from Lightroom. 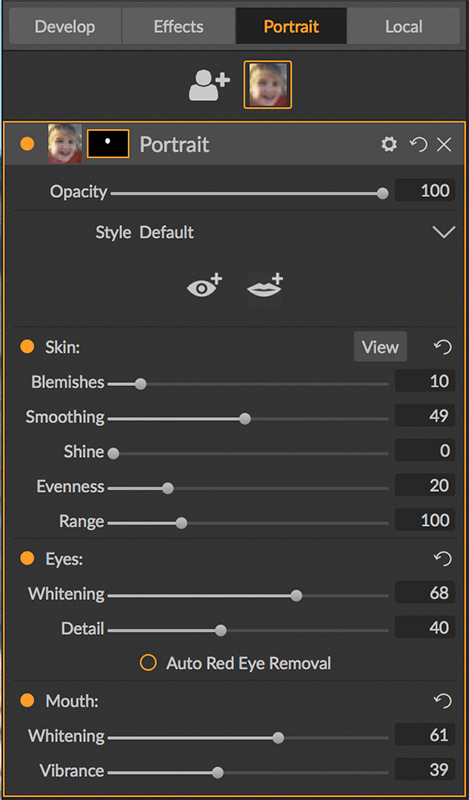 Lack of this ability in the previous version was a deal breaker from some long time Lightroom users. ON1’s migration tool uses artificial intelligence to accomplish this. I’ll report back after I’ve tried it to let you know how well it works. The look and feel is nicer. It’s more subdued and coupled with the “combined workflow” it makes it that much more enjoyable and easy to use. 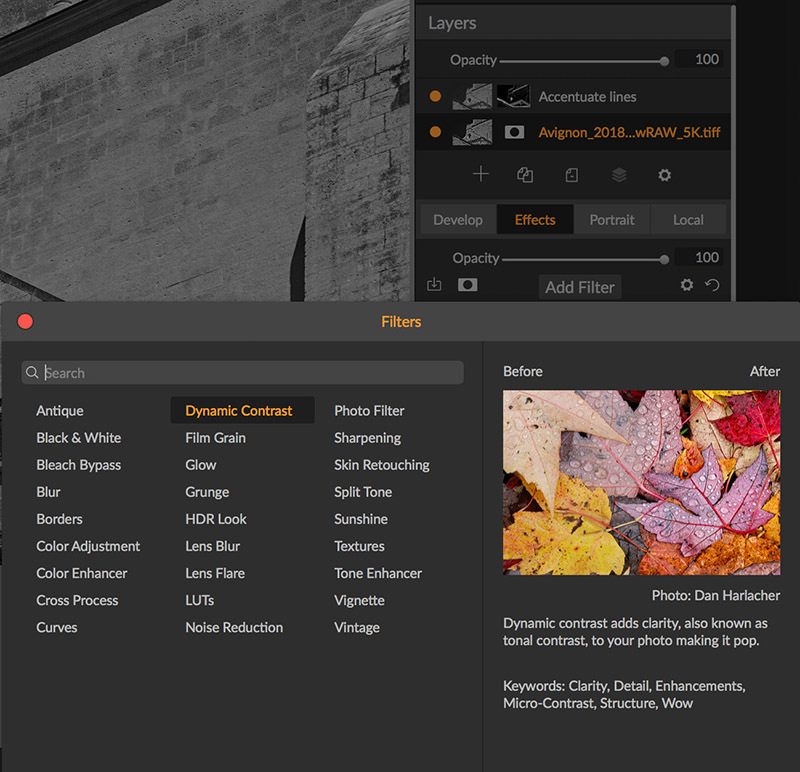 A big one for me is renaming filter and image layers without the cumbersome appendages of the filter name which drove me a little crazy in the 2018 version. It just makes it much easier to see what you’ve done when you go back to an image with several adjustment layers. The new filter selector with image examples and search bar is a nice touch as well. 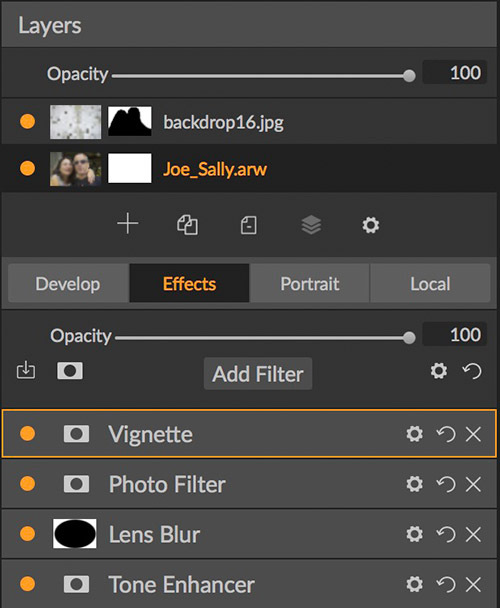 New in Photo Raw 2019: When you click on “Add Filter” you get this nice new dialog with a search box, sample photos, and descriptions of the filters. ON1 has even worked on improving the aesthetics. The previous version (2018) is on the left and 2019 is on the right. This is all subjective but I find the lower contrast of the new version easier to look at when I work for long periods of time. It’s minor, I know, but I thought I’d point it out. After working with Photo Raw 2019 pre-release and now the release version for several days, I’m really enjoying it. Although I use many different tools in my workflow this makes a great main hub and all-in-one solution for both working on images and managing them. I have yet to try the new A.I. (artificial intelligence) powered Lightroom migration tool but if it works as promised the fence sitters waiting to make the jump won’t have any more obstacles. The way I judge if a product has matured is if it’s fun to use and intuitive without hurting my brain figuring it out. Of course it’s not perfect, nothing is, but I’d say in this 2019 version, ON1 has arrived. Joel, I use ON1 as my main program but have Topaz Studio and AI clear. I also have Gigapixel, as well, since it seems to be the ‘go to’ for resizing over On1 Resize. Do you have a suggested workflow that allows me to import into On1 and also use AI Clear up front? Given that On1 maintains RAW files throughout the post-processing, converting to TIF to export to Topaz (for AI Clear), then return to complete my editing in ON1 doesn’t make sense to me because I’m then using the enormous TIFF file. After all, I understand that noise elimination ‘up front’ is the preferred method, hence my problem! You bring up some good points. My approach is to jump into Topaz Studio for AI Clear only for images for which I have an intended purpose. This means that I would be converting these images anyway, to either TIFF (for prints) or JPEG (for IG, blog posts, etc.) That way I’m not unnecessarily creating large TIFF files. I also use TIFF lossless compression (Zip) to keep the size manageable when using TIFFs. This isn’t any different than if I was doing everything in Photo Raw or LR because ultimately I would have to go out to a TIFF or PSD and/or JPEG at some point. I really miss the Quick Mask tool that was in 2018 and is not in 2019. Yet. They said it is coming in December and that it will be AI Mask, meaning what? As you discovered they are planning to introduce a new AI powered quick mask sometime in 2019. The old one was tied to the destructive editing of the old layers module. I suspect it will be worth the wait- fingers crossed.